Product Segmentation & Sales Data Analysis is one of the best ways to gain insights about sales behavior, product affinity, market baskets and understand emerging patterns of customer engagement. Effective segmentation and sales data analysis leads to enhanced product strategies and marketing messages that deliver measurable results. Market Equations helps organizations apply extensive analysis on Sales data to uncover insights on sales and product behavior, trends and patterns to help design smart marketing strategies to increase revenues and maximize profitability. 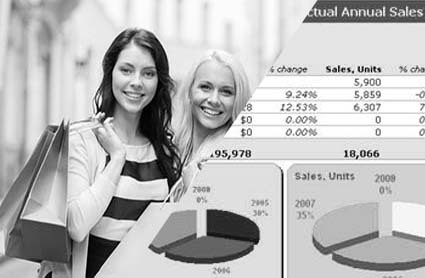 Market Equations helped a large multi brand retail company based in Australia analyze their customer database to understand the varying sales trends, customer behavior, product affinity, market baskets so as to effectively target their marketing efforts. An in-depth study of sales data was performed to identify patterns of sales by Customers across all sales regions, by each brand, and SKUs sales trend for key national accounts. Product Segmentation and Sales Data Analysis helped the client understand varying KPI trends across customers, regions and SKUs and hence, improve sales productivity significantly through targeted and smartly designed marketing strategies. Founded in 2006 and among the first Data analytics outsourcing firms in India, we help organizations apply extensive analytics to harvest and nurture data; uncovering hidden truths and interdependencies that eventually translate to actionable business insights. Product Segmentation and Sales data analysis services from Market Equations India helps organizations understand varying sales trends, customer behavior, product affinity and market baskets so as to effectively target marketing efforts to increase sales productivity and maximize revenues.